German/American metallers ACCEPT have announced the addition of guitarist Uwe Lulis (GRAVE DIGGER, REBELLION) and drummer Christopher Williams to the group's ranks. Says the band: "'Blind Rage' tour 2015 part II is on the move again, returning to South America with OZZY OSBOURNE, KISS, JUDAS PRIEST, MOTÖRHEAD and many other greats! Belgium, Czech Republic, Denmark, Germany, Greece, Hungary, Poland, Slovakia, Slovenia, Spain, Sweden and more are already in their intense battle plan for 2015! 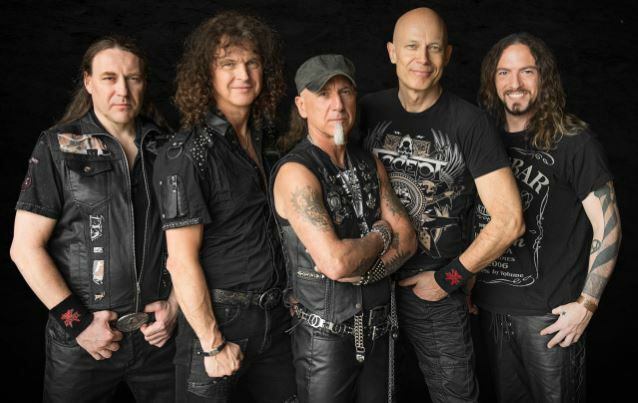 "The past, present and future for ACCEPT was, and still is, beyond the band's imagination, but not beyond their reach! We all know they could not have come so far without their fans and the endless gifted people who are working so hard for ACCEPT! Thank you to all of them from all of us with the promise that we will come back — better and stronger and even more devoted than the last time!" PANZER's debut album, "Send Them All To Hell", was released on November 28, 2014 via Nuclear Blast.